There really aren’t any normal days on a farm although each day brings some of the same chores – feeding and checking on the animals, checking water, gates and fences. Each morning, after tending to my needs as well as those of the house cats and dogs, I check on Carly. She’s a Shetland, a primitive breed more than 1,000 years old, from one of the more than 100 Shetland Islands and she’s upwards of 17; I’m guessing closer to 18 or even 19 years. In a word: ancient. She’s been a good little ewe and still loves to be petted and loved upon but, in recent weeks she’s been having trouble getting to her feet. Some days she’ll become cast, meaning her center of gravity is off and she lies there, waving her legs about and waiting to be rescued. I’ll have to heave her to her feet, let her stand against my legs so she can regain her equilibrium and blood flow before she toddles off. For a description that will make you chuckle, read here. A few of my Shetland sheep are as wild and fey as the Islands themselves where the 70,000 or 80,000 sheep outnumber the 22,000 humans by a good bit, or so says Jamieson and Smith, wool brokers. But some, like Carly, are cute and worrisome, especially when treats or nose rubs are slow in coming. This group of five American Curly horses needed a round bale of hay but this time of year is dicey because the horses would rather graze sparse pickings. 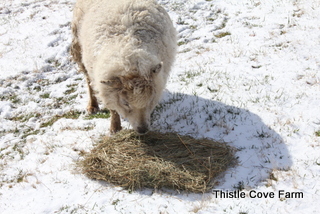 We’re expecting another snowstorm tomorrow so hay is needed to supplement said sparse pickings and it’s rather an involved process to set out hay. First the horses need to be put up in a small lot to prevent them from getting into the hay lot and tearing up a bunch of hay. Then, using my John Deere 45 hp tractor, I get a round bale of hay from the hay lot and take it over the hill to the lower end of the pasture. Frankly, this frightens me to death and I nearly always wet myself…sad truth that…because I’m leaning way too far for my own peace of mind and while toting a 1200 pound bale of hay. Yes, I do use the front end loader to balance myself but my skill level isn’t the best and what takes me an hour to do, the men can do it in 15 or 20 minutes. They drive faster than one foot on the brake and the other tapping nervously to the side as I allow the tractor engine to pull me along at a whopping 1 mph. 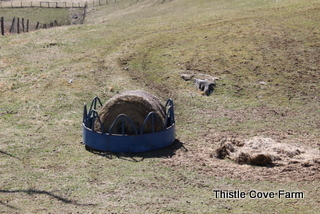 When I put down the round bale, then I have to heave upright the metal feeder so it can be rolled and moved to the new bale of hay. I’m not sure how much those feeders weigh but feel confident in saying it’s a couple of hundred pounds. Again with the wetting…sigh. 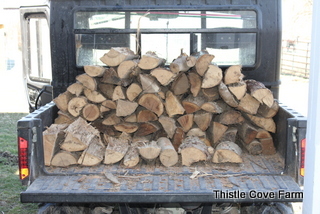 before taking the Ranger and getting in a load of wood for the stove. I’m not sure how much snow we’re supposed to get but it’s a nice day and better to do outdoor work in good weather. 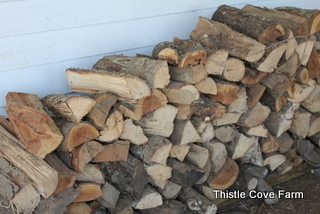 The wood is stacked on the back porch where it’s kept dry and convenient to retrieve. 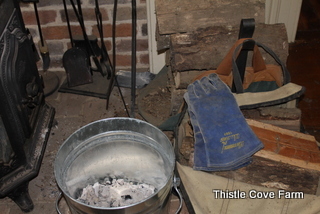 The metal bucket is used to clean ashes out of the wood stove and I keep wood stacked safely out of harm’s way. This prevents those cold, icy trips to fetch wood late at night. Safety first! And, since it’s yet a pretty day, I take time to move and stack the plastic pallets. 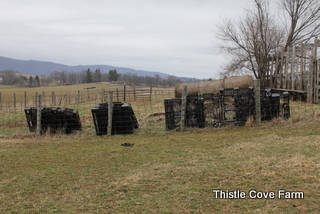 Round bales are stored on the pallets which prevent, or at least slow down, the decaying of the hay bales. That’s all the outside work I’m doing for the day; now it’s time to go inside and clean house after making something for lunch/supper. Wow I'm tired just thinking about all of your chores! I hope the snow was brief and the sun shines soon. It's been rainy and cool here for a few days but only light jacket weather during the day so I can't complain at all. Hugs! Sparky, Maxie sounds a doll! I used to have a motorcycle…305 Honda Super Eagle…in my younger days. LindaSue, there's no other choice for me; I refuse to give up until God calls me Home. There are, however, days that I want to stop, lay down and cry myself out. Andie, it IS a good life and a hard life, even more difficult now that Dave is dead. I miss him every hour. Lynne, it's a Woodstock Soapstone stove out of Vermont and keeps me wonderfully warm. It's helped with my heating bills as well. Pom, I do it because I refuse to give up -grin-; at least, not until God calls me Home. Karen, it depends on the weather and how much the horses are eating. In colder, wet weather the horses eat more hay to keep warm. 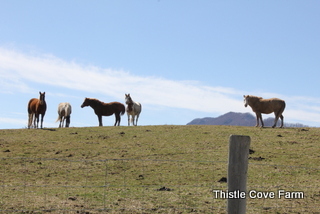 The men told me they'd help but never seem to be around when I need them…or rather the horses need hay. It's just in that one pasture and just this time of year; I'm getting ready to keep the horses out of the upper pasture, thus the need to put hay over the hill. Dewena, all part of the master plan but it can't happen overnight. Your concern is appreciate though and thank you. Karen, my day is different from most women, and a lot of men, I know -grin-. Marsha, everyone tells me when they die, they want to come back as as animal on my farm. I'm known for my excellent care giving. Suzy, oh an Angora…such lovely creatures, I do love goats! Annie, your days sounds over the moon busy as well; stay safe and take time for YOU! Sara, as of now, no snow but a LOT of rain; supposed to do something every day this week. Kathy, it is a labor of love but would love to find some new forever homes for some of these critters. I'd like to think about moving closer to family. Dawn, I used to be city -grin- but even if I move, it's going to be to a rural area; no more urban life for me. Vicki, there are plenty of days I'd like to give up but that's not a choice. Dave and I worked too hard for this farm for me to give up. Cyndi, it is a beautiful place and God has blessed us/me greatly. Donna, it exhausts me -grin- and my 60th is in a couple of weeks. Gail, Carly continues to struggle; it's getting so near the end for her. What a labor of love. So much of yourself is poured into this farm. I'm so amazed. That poor Shetland struggling made my heart hurt. Have a blessed day! I'm exhausted just reading about your farm chores! I'm not sure I could tackle that kind of labor even during my prime years. So my hat is off to you! You have an awesome farm! I love farm animals and I'm in love with Carly. I'm always a champion for the underdog– oh I hope she does well. You are so good and loving to care for her as you do. I love to hear about your farm and your work. It's ok that you are slower than the men. That you get out there and do it is what matters. You are amazing. It's fascinating to a city girl like me. Little Carly is a sweetie pie and your care shows how precious she is. The primitive breeds fare quite well for a long time. What a lot of labor to maintain the necessities to sustain you and your farm animals, but a labor of love I suspect. I loved reading this Sandra and think of you often. Well Sandra ..I see your in the running for some snow .. what happened to mr. groundhogs forecast of an early spring ….?? Sandra you are an amazing and talented woman in so many ways. I admire you for your gritty hardworking ways. life on the farm sounds wonderful, but a lot of work. my day was good, but not hard like yours. I went to a local church having a pancake breakfast to raise money for Vacation Bible School this summer. Had a great one, so much nicer when someone else cooks and hugs on you while you are there. Did some errands, walked about a mile on the greenbelt. Came home feed ferocious son his box of breakfast I had brought him. Watched him drive away with my motorcycle on a trailer behind the old ford. Saw him bring it back battered & mirror broken while it was still on the trailer. What would have happened if he had actually ridden it? Normal life here, he breaks anything that belongs to me or Dad. Had a great lunch from leftovers from yesterday. Shook & rubbed my aching head because of son's antics. I have earned every gray hair on my head. I spent a long session on that empty lot using my metal detector, which I love & do not let my son use! Cleaned up some of my found treasures, wishing they were gold silver, and not aluminum. Cleaned up son's mess of mud he had tracked through the house (AGAIN, sheesh)!Waited on Dad to come home from his Boy Scout camp out, where he brought me fresh mud (Again). Plus smoky, smelly laundry from the camp fire, and discussed yoga with him from a you tube video I watched, wondering if either one of use could learn the movements, not the mind stuff and help our backs & knees(?). Hauled out the trash in the dark down the muddy driveway (Yes,don't say it). crashed here in this chair where I am too tired to even clean up and go to bed. I think I should move to a farm. 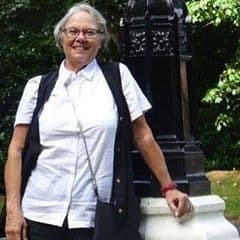 Well Sandra it's a hard life but it is a good life as close to nature and survival anyone could get. I know what it's like to care for just a few livestock of goats let alone the number you care for. Our life is similar but on a small scale and you even get time to blog. Girl you are constantly on the go! Carly is special and I would do all of that for my oldest Angora if and when that happens. Hugs to you for a day's work well done with courage and optimism. Your normal day is so different from mine! Very interesting post. You've made me nervous just reading this. Do you think maybe you ought to be phasing out this kind of work for you? 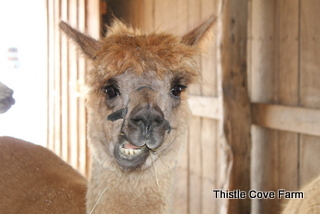 The sheep are beautiful and the expression on that alpaca's face makes me want to hug him or her. It was interesting reading about your day. You're a better woman than I am, Sandra. Sandra, how often do you have to set out a new round bale? Would it be possible to have one of the guys come around and do atleast that one chore for you? I'd be a little nervous too if I had to do what you do with that equipment. I am now very grateful for my little 70 lb. bales. Love that little shetland, what a pretty old girl. I don't know how you do it all, Sandra. You're so smart and strong. You are quite the woman . . . I love your spirit. What kind of stove do you have. I used to have a Vemomt Castings that kind of looked like yours . . . nothing like heating with wood! I hope the storm heading your way doesn't bring too much havoc! 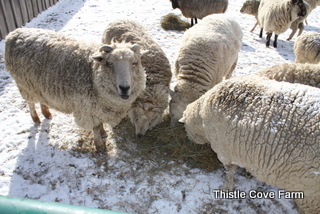 My husband wants to live on a farm…I do too…but I know I would spend an inordinate amount of time snuggling the livestock! For now, I will stick with rescued cats and dogs and dream. You have a GOOD life, my friend. I envy you! My precious little dog Maxie (mini schnauzer, age 13) is in failing health and does a little number like the Shetland Sheep. She's having trouble getting up, walking, now mostly blind and hearing is almost gone too. [sigh] Poor things. It's hard to watch them age, isn't it. We're experiencing the wet stuff too but it's remaining as liquid. Feels like it's getting colder too. Old Man Winter just doesn't want to let go! After reading your posts makes me especially thankful we don't get snow now. That has to add to your work load. Please do be careful. You're too precious to lose. I wish I knew how to farm. All I know is how to work. Accounting is my forte but motorcyling, history and gardening are a passion.